I throw out an easy challenge. It sounds so simple, but it’s kinda complex. The 2019 Dr. Doran Scholarship essay contest is live! The Dr. Michael J. Doran Scholarship, Inc. was established by his family in April 2016 for the benefit of Thomas S. Wootton High School students attending college upon graduation. 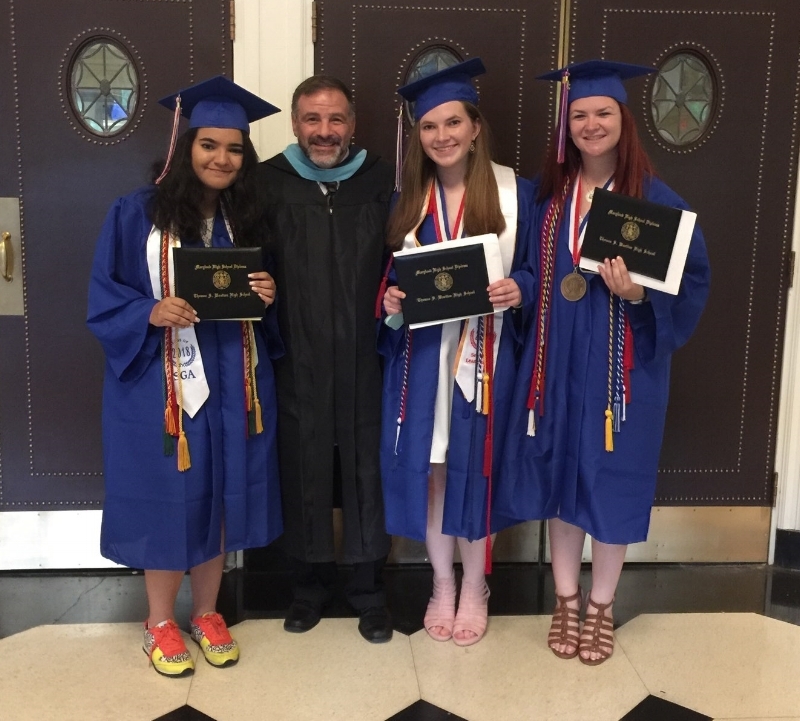 Scholarships provide financial assistance to graduates of Wootton in Rockville, Maryland whose parents were not able to go college, as well as students with particularly compelling circumstances. Since May 2016, with input from school administrators and the PTSA, the Doran family have awarded scholarships to select students from Wootton’s graduating class who embody the ideals of Dr. Doran. Click here to learn more. Rifaa Qadri was born in Tunisia and grew up speaking Arabic and French. Her family emigrated to the US in 2013. Transferring to Woottton as a sophomore Rifaa had to learn English and make friends quickly. Riffa reactivated the Best Buddies club at Wootton to bring together her peers and other students with physical or intellectual disabilities. She will attend the University of Maryland where she plans to study Computer Science. Rifaa's long term plans include law school and advocacy for the less fortunate. Gabrielle Vinick is headed to the University of Wisconsin, Madison in the fall where she will study Political Science and Communications. She hopes to spur others to become interested in politics and civil engagement. At Wootton, Gaby was in poms and ran many charity races. In 2013 she launched Chemo Connect to provide patients undergoing chemo - especially those alone - support. Katie Schreck loves writing and was a managing editor of Wootton's student newspaper, Common Sense. She will incorporate her interest in Journalism with Sports Management at Temple University's Fox School of Business. Already she has interned with the Washington Redskins radio station. Katie was selected as a Teen Engagement Fellow by The Jewish Federation of Greater Washington. The Wootton Auditorium - now named for Dr. Doran - will be officially dedicated this Thursday, 2/28, at 7pm. Join us there. The 2018 Dr Doran Scholarship essay contest will be announced on Dr. Doran's birthday, February 28th.